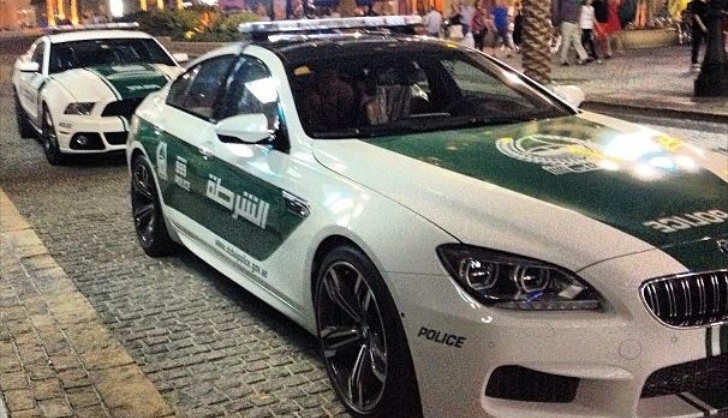 The Dubai Police official maybe the happiest person on earth, as are receiving a number of heavy bonks in their fleet, not for catching the thieves, but instead to patrol the tourist areas, and also to entertain the tourists with the glimpses of such rare pieces. Already enjoying the dose of Lamborghini Aventador, Ferrari FF, Aston Martin One-77, Mercedes Benz SLS AMG, Bentley Continental GT, and now finally the fastest BMW i.e. M6, which does all the excitement with under pinning of 4.4-liter town-turbo V8 capable of delivering 560 horsepower to the rear wheels, is added to the clutter, along with the Ford Mustang GT. However, it is also learnt that officials had pledged to bring in Bugatti Veyron for Dubai Police but it is still don’t know ‘when’. Finally the Ford Mustang is given with the finest of 5.0L V8 to suit avatar of GT badge for most of the time. Must say, Dubai really rocks, and specifically in the green and white paint job, isn’t it!